The first organizational meeting was held on April 18, 1875. Meetings were held at the Cosmopolitan Hotel (formerly the Orndorf) where ceremonies were held on the second floor, which subsequently became known as the Masonic Hall. Santa Rita Lodge of Perfection No. 1, Territory of Arizona, held its first class of 7 initiates on June 3, 1875. On December 3, 1882, the S.G.I.G. 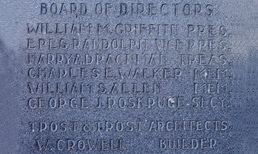 of California invested another 12 initiates, one of whom was George J. Roskruge. Famed Mason Albert Pike presided at the meeting held on April 23, 1883 and the Lodge of Perfection was chartered on April 25, 1883. 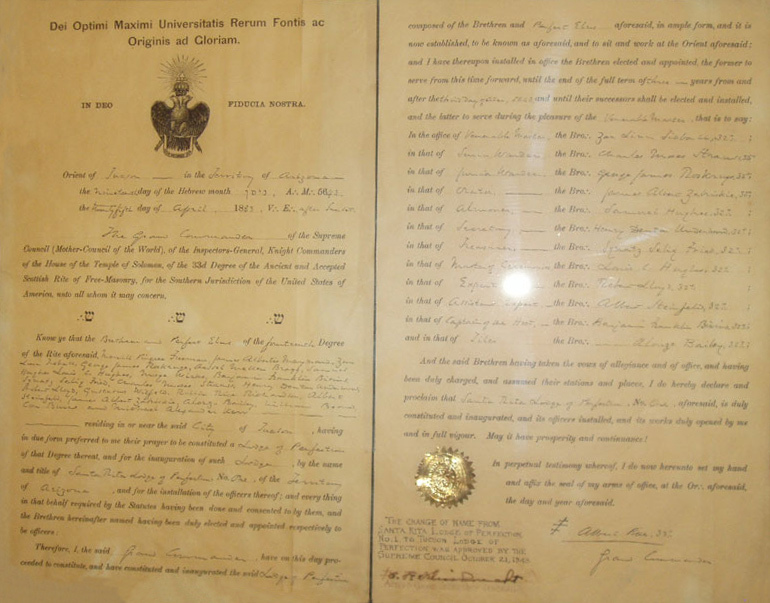 Below is the original charter and is signed by Albert Pike. Albert Pike himself attended the chartering ceremonies and it had been said that he was looking out the second floor window towards the mountains and asked what the name of the range was. When the reply was "the Santa Rita Mountains," that is what he named the first Lodge of Perfection here. Among those original members, Albert Stanfield, of Stanfields Department Stores. Morris Goldwater, and George Roskruge rode their horses from Prescott to be in attendance for the ceremonies. New life was instilled into the Lodge by George Roskruge who was serving as a Surveyor for the U.S. Government at the time. Unfortunately, the Lodge failed to function and they turned in their charter in 1886. Those who wished to become Scottish Rite Masons had to travel to San Francisco or Texas. During this same period, the Tucson Masonic Club was founded with Edward Nye Fish serving as Chairman and George Roskruge as Secretary. Following closely on its heels was the formation of the Masonic Relief organization in October of 1879. This group, involving basically the same men, evolved into a permanent organization and became the foundation of Tucson Lodge No. 4 in 1881, Sam Hughes was its first initiate. The formation of a Scottish Rite floundered until 1903 when once again new interest was generated. The Phoenix group wanted to move the Tucson body to Phoenix but Roskruge said no. The Lodge then came alive under the leadership of General George J. Roskruge with a class of 24 initiates. The Lodge of Perfection was formed again, this time to stay, and it flourished. Roskruge was named Venerable Master. The Lodge moved to a new building where A.V. Grossetta built the Opera House taking over the entire second floor. This was where the now State theater is located. 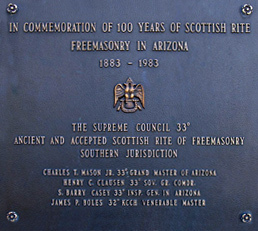 The design and construction of the current Tucson Scottish Rite Cathedral began sometime before Arizona Statehood and the building's cornerstone was laid December 8, 1915. The building was officially dedicated in 1916. Below is a photo of Tucson Scottish Rite members in front of the Cathedral. Completed in 1951, the "Ochoa Addition" also known as the "Peter E Howell Addition" who was the Venerable Master in 1911-1912, was added at a then cost of $310,000. 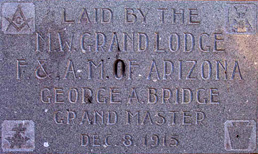 The building was then rededicated by then Grand Master of Arizona, Fred W. Moore of Mesa. A combined choir of the Job's Daughters, Rainbow Girls, and DeMolay sang at the dedication. The property where the addition was built has historical significance as it was the only place in Arizona at the time where a President of the United States had stayed, then President Rutherford B. Hayes. 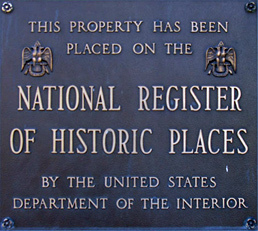 In 1979 the entire building was placed on the National Register of Historical Places. Harry "Arizona" Drachman (the first Anglo-Saxon to be born in Tucson) was appointed Deputy of the Tucson Scottish Rite in 1912 (now referred to as the Personal Representative) and remained such until 1952. Nelson Charles Bledsoe was appointed Deputy January 15, 1952 and served until his death.